MEDIUM ROAST, WHOLE BEAN: Cheeky, bright, precocious. A bright, chocolaty concoction for the smart-thinking, deep-drinking, good-at-their-game-in-the-morning crowd. ORIGIN AFRICA, CENTRAL & SOUTH AMERICA: Grown in a socially and environmentally responsible way, by farmers with sustainable businesses they can depend on. RECOMMENDED BREW METHOD: French press (coarse grind), drip machine (medium grind), pour over (medium-fine grind), and cold brew. ORGANIC, FAIRTRADE, KOSHER, SHADE GROWN, ARABICA COFFEE: Coffee that is good and fair for the coffee drinkers, the farmers and the planet. 100% Certified. ROASTED IN THE ROCKY MOUNTAINS: It's all deep, dark and delicious, roasted right below the towering Canadian Rocky Mountain peaks. 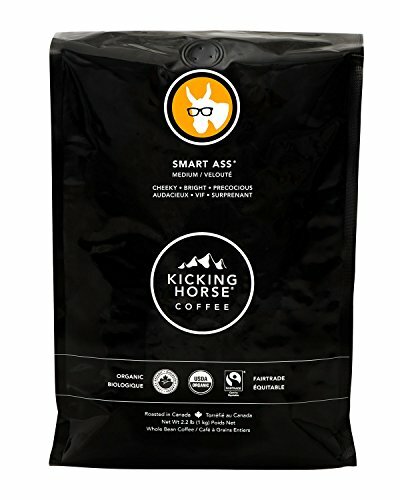 If you have any questions about this product by Kicking Horse Coffee, contact us by completing and submitting the form below. If you are looking for a specif part number, please include it with your message.